The Mars Series Shell Pack offers 100% Birch, shallow depth shells with the new SONIClear™ bearing edge, producing a fast, clear tone with a quick rebound. 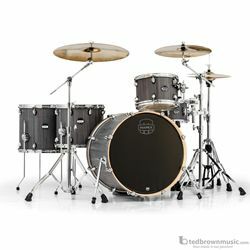 The 2 up and 1 down configuration keeps the toms within reach while the extra deep bass drum produces a powerful, naturally equalized tone. The Birch 6 Ply 7.2mm shell, with the new SONIClear™ Bearing Edge, allows for the direct transmission of sound, reduces unwanted frequencies and provides a strong fundamental pitch and an effortless tuning experience especially at lower tunings. The SONIClear™ tom suspension and floor tom feet increase overall resonance by preserving vibration in the shell and keeping stress away from the tension rods, helping the heads stay in tune.